My Mom recently gave me her old cedar chest. It sat in our storage room next to the big upright freezer all the years I was growing up. Sometimes my niece and I would lift the lid and pilfer through the contest, looking for treasures. Mom would usually catch us before we’d dug all the way to the bottom and decide we had better things to do. My grandpa bought this cedar chest for my Mom after she spent a summer helping him on the farm in her teen years. 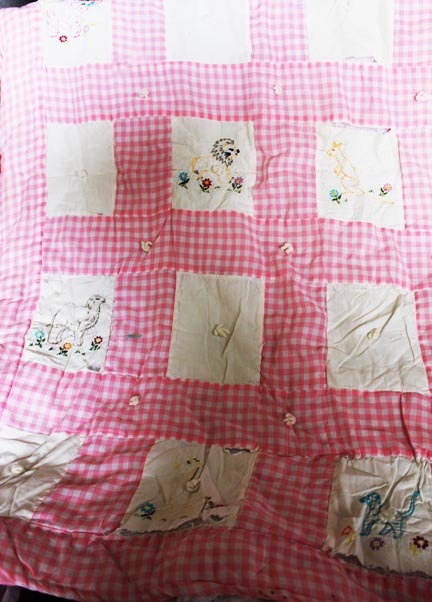 I don’t know what treasures she filled it with at that time, but I do know it was her “hope chest” – a place a girl could store things for the household she someday hoped to have, like embroidered pillowcases and such. Opening the lid of the cedar chest brought back an array of memories for me. The scent of cedar still drifts out of the trunk even after all these years, reminding me of all the afternoons my niece and I spent seeking out the secrets hidden in the cedar chest. 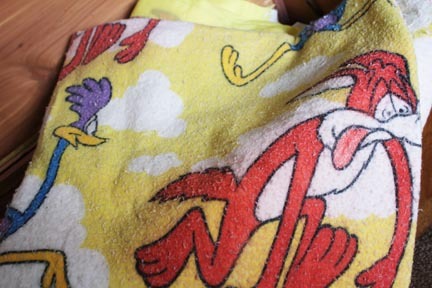 This blanket, featuring Beep Beep and Wile E. Coyote was mine when I was a kid. As you can see, the blanket was well used. Around the time I switched bedrooms when my brother moved out, my blanket disappeared. Evidently my sister liked it too, because it ended up in her possession and she refused to give it back. 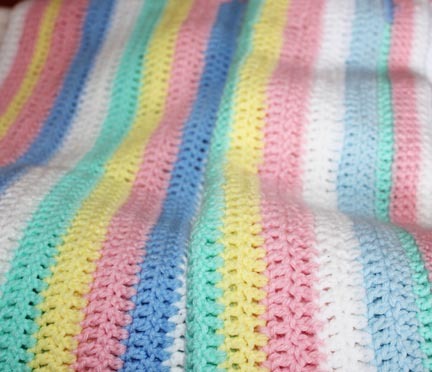 This blanket, which is beyond well used, was one of my baby blankets. I forget who made it for me, but I loved it. It was just the right amount of fluffy and soft. I remember dragging it with me when Dad would let me ride in the swather while he cut hay. I’d sit on the floor on my blanket and share a roll of Necco’s or Butter Rum Lifesavers with Dad. This was one of my baby outfits. There is a photo of my dad holding me while I was wearing it. 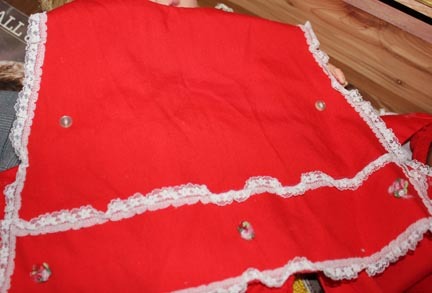 There is this little top, a pair of red pants and a white blouse that goes with the ensemble. 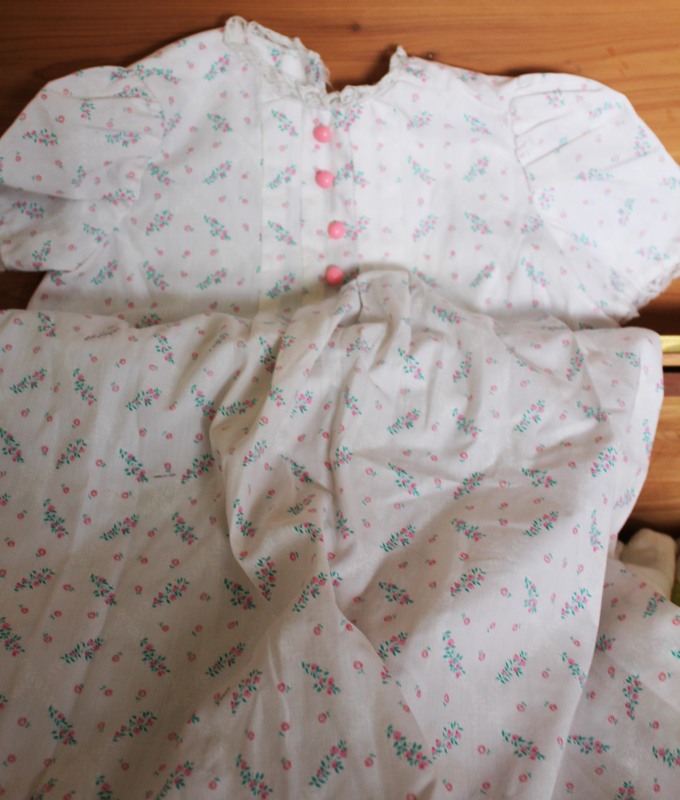 This little dress my mom made for me when I was probably about three. She also made a matching one for my baby doll. I always liked the cheery little sprigs of flowers. These were two stuffed toys from my childhood. The skunk my beloved Aunt Robbie gave me one night when my parents had to take my sister to the emergency room and they dropped me off at her house, half-awake and completely terrified. Aunt Robbie dug out some toys that had belonged to my cousins and the skunk was so soft and cuddly, she let me keep him. 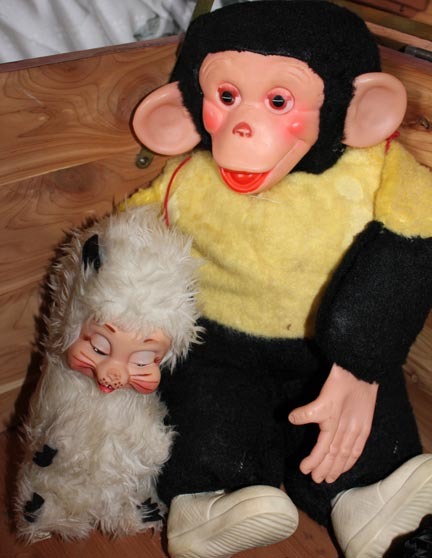 The goofy looking monkey was named Hinkle. He had the squishiest hands and the hand you don’t see in the photo is holding a big plastic banana that you could shove in his mouth. Filled with the same stuff they put in bean bags (don’t ask how I know this), he was smooshy and fun to play with. 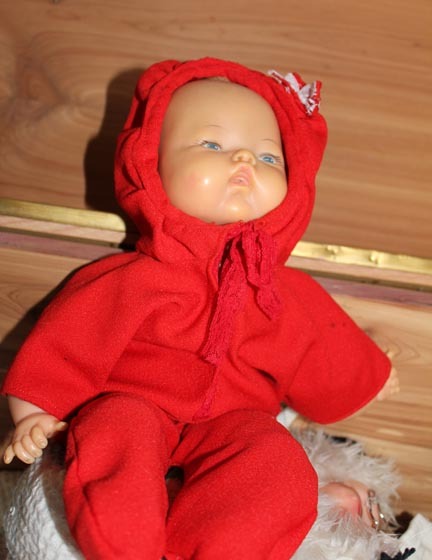 My sister got this doll when she was a little girl, back in the early 1960s. They don’t make them like this anymore. When I came along years later, I declared the doll my own, despite the fact that Thumbelina had no hair left at this point and her cloth body was stained and the filling was a bit lacking in spots. She was the best baby doll in the world to cuddle. The absolute best. Maybe the theft of my Beep Beep blanket was retribution for stealing my sister’s doll, although she had long ago abandoned her for greener pastures. 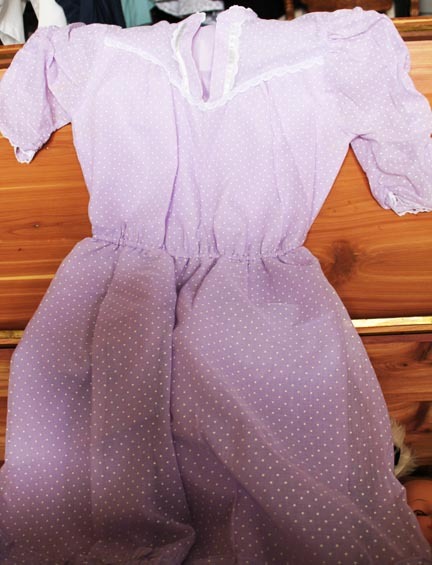 Much to my surprise, Mom not only saved the dress from my eighth grade graduation, but put it in the cedar chest. It was such a big deal when I got this dress. My parents were going to the big city – an almost seven hour drive – for the wedding of their best friend’s daughter. I got to tag along. One of the other daughters took Mom and I to a huge mall (it even had an indoor skating rink!) shopping and she helped me pick out the dress in some fun little boutique store geared for teens. I felt so grown up and sophisticated. She helped me pick out three-inch high white wedge sandals to go with the dress and I was in seventh-heaven. I loved, loved the dress and the sandals. 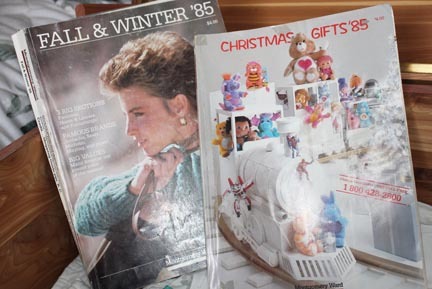 Anyone who grow up prior to the 1990s will probably remember the joy and excitement catalogs brought when they arrived in the mail three times a year. You’d get the Spring/Summer Catalog and the Fall/Winter Catalog. But the one anyone under the age of 12 anxiously awaited was the Christmas catalog. 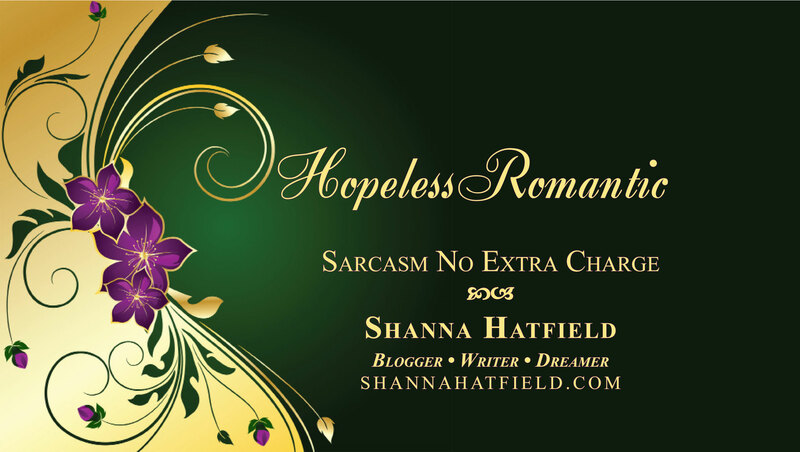 I could spend hours and hours drooling over all the wonderful things I wished and hoped to get for Christmas. The year Montgomery Ward’s announced they would not do the catalogs anymore, we saved the last two that came. And there they were, tucked into the cedar chest – from 1985. The clothes and hairstyles are quite entertaining and the toys in the Christmas catalog… Oh. My. Goodness. Determined to teach me knitting and crocheting, Mom finally gave up on knitting when it became blatantly clear I was going to take someone’s eye out with the needles. She settled on crocheting and didn’t give up until I had crocheted this baby blanket. I think I ripped out ten times more stitches than I made, but I finally got it finished and stuffed it in the cedar chest, hoping to never see it again. It made me smile when I pulled it out of the chest after all these years. I still can’t crochet or knit to save my life, but it wasn’t for a lack of effort on Mom’s part. I think my favorite thing of all in the cedar chest was this pillow cover Dad brought back to Mom after he served in the Navy Reserves. 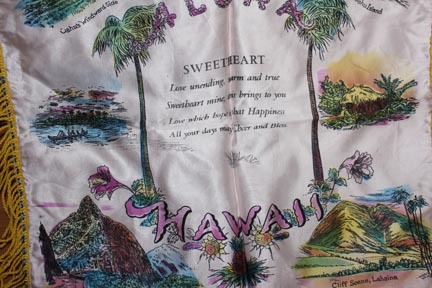 Dad is the romantic of my two parents and the fact that he picked this out for Mom when he was just 19 makes me smile and it may even make my heart melt a little. 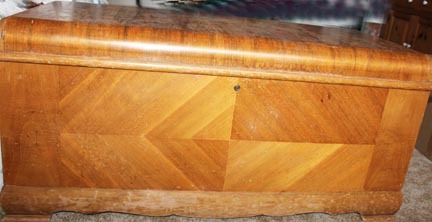 Thanks, Mom, for the cedar chest and for all the wonderful memories stored inside.